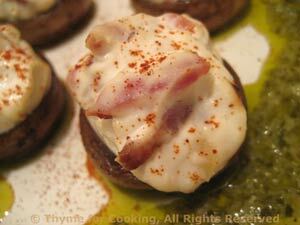 Mushrooms Stuffed with Chevre, Thyme for Cooking easy starters. These used to be standard party-fare, many years ago. Made with bacon and cream cheese, they were always a hit. I've updated them and made them a bit healthier... but not enough to spoil the wonderful creamy - bacon flavors. Clean mushrooms, removing stems. Discard stems or trim and save for another use. Sauté bacon in a nonstick skillet over medium heat until crisp. Remove and crumble. Pour off all but 1 tsp of fat. Add olive oil to skillet and return to heat. Add mushroom caps and sauté until light brown, 5 minutes, turning once. Remove and place on a baking sheet - with a lip so they don't slide off. Put goat cheese and yogurt into a bowl and stir to combine. Add bacon bits and mix. Spoon into the mushrooms caps, mounding slightly. Bake in 400F (200C) oven for 12 - 15 minutes, until they are heated through, but before the cheese melts off the mushrooms. Remove. Drizzle the Pesto Vinaigrette on two plates. Arrange Mushroom Caps, sprinkle with paprika and serve.